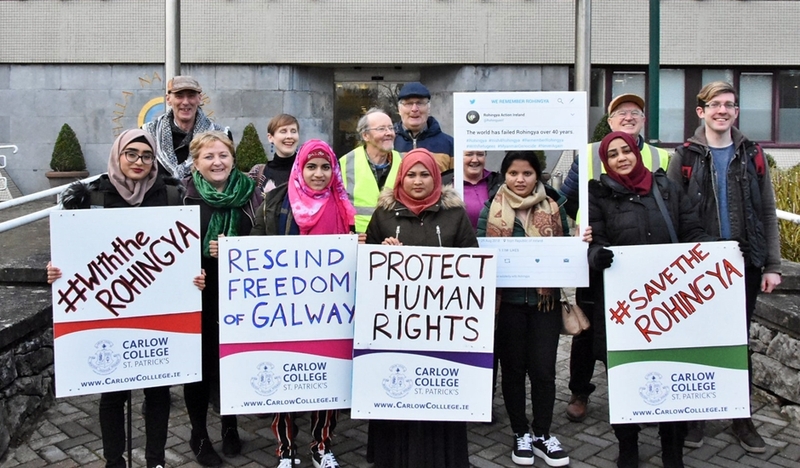 The Rohingya community in Ireland welcomes the gesture of Galway City Council stripping Aung San Suu Kyi of Freedom of City bestowed in 2005, and the resolution calling to endorse the UN Fact-Finding Mission report to refer the Myanmar Military to the International Criminal Court for the genocide against Rohingya. The overwhelming support for both resolutions send a clear message of condemnation the gravest crimes committed against Rohingya and other ethnic minorities as well as a message of solidarity with the victims and survivors of genocide under the leadership of Aung San Suu Kyi. Aung San Suu Kyi was the hope of many people inside and outside Burma at the time of the decade-long military regime. Her struggle under the house-arrest was deserved to be recognised and honoured. However, her recent inaction to stand up for the persecuted Rohingya community, the failure to condemn the military for the genocide against Rohingya and war crimes against other ethnic minorities, and the denial of well-documented crimes against humanity at the height of her power, deserve to be condemned, not to be condoned. The jailing of two Burmese Reuters journalists for investing the crimes of Myanmar Armed Forces, the rise of Islamophobia and hate crimes against religious and ethnic minorities, and the continuous negligence of over 120,000 internally displaced Rohingya inside Rakhine State of Myanmar and more than a million Rohingya refugees in neighbouring Bangladesh, highlight the moral failure of yesteryear-icon of democracy. The overwhelmingly-supported two resolutions to strip the Honour and to condemn the genocide against the Rohingya community is a gesture of solidarity and compassion to the resettled Rohingya community in Ireland and their extended family and friends who remain persecuted under the Myanmar military in Myanmar It is also a message of solidarity and hope for the many thousands of Rohingya who have been displaced and are facing many hardships in the refugee camps in Bangladesh. The community sends a message of gratitude to the people of Galway and the city councillors who stand up for them at the time of great injustice and despair.